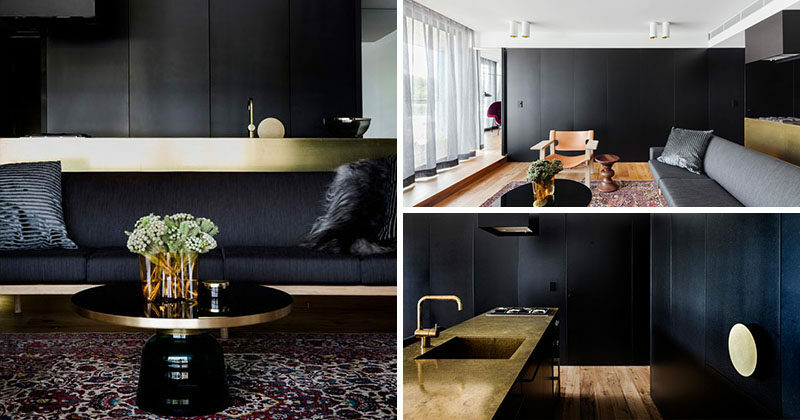 Architect Prineas have designed the interior for this sophisticated modern apartment in Sydney, Australia, that features plenty of black and gold accents. 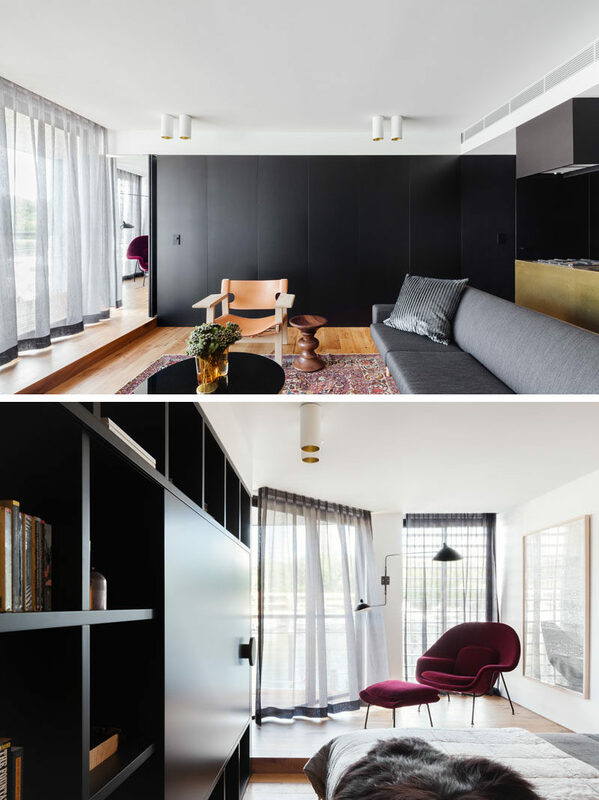 Inside the apartment, a wall of black cabinets lines one wall, while the living room opens up to the balcony with water views. Behind the living room is the kitchen with more black cabinets and an island with a gold countertop. 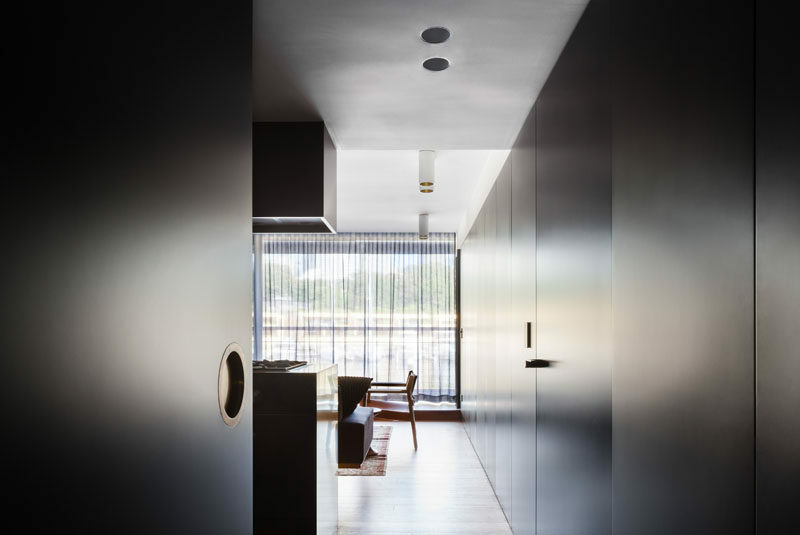 Looking back at the black cabinets that line the wall, you can see that a door to the bedroom is hidden on the left side. 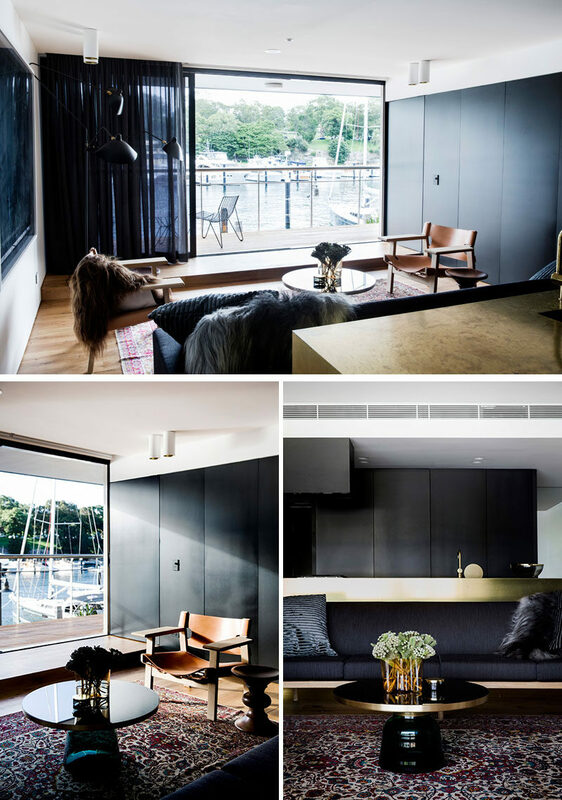 Inside the bedroom, there’s a raised platform with a comfortable chair for relaxing and watching the boats outside. 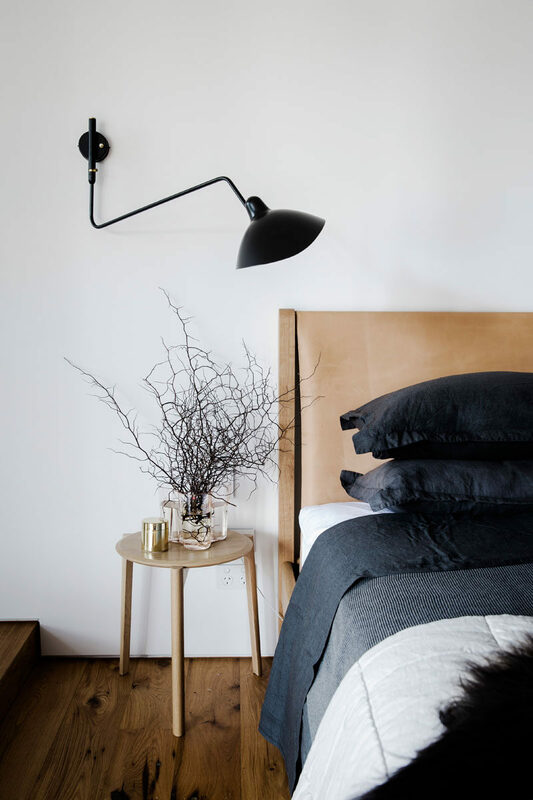 Touches of black, like the wall lamp and bedding, are featured throughout the apartment, continuing the look of the living area. 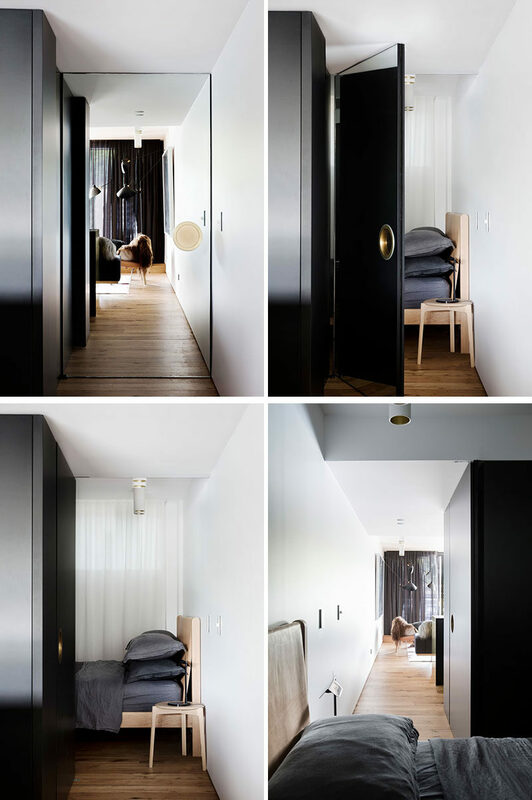 Beside the bed, there’s a sliding barn door that can be opened to reveal the bath and shower. Here’s a look from the bath out into the bedroom. As there are no windows in the bathroom, the open wall allows natural light from the bedroom to fill the bathroom. Light grey tiles and gold hardware have been used to keep the space bright. Separating the wet spaces of the bathroom from the vanity and toilet is a large sliding black door with an over-sized door handle. Here’s a look at the rest of the bathroom that has black walls, a gold framed circular mirror and a white vanity. The apartment also has a second bedroom, this time it’s located to the right of the kitchen, and is hidden behind a mirrored door, that sits flush with the cabinets when opened. 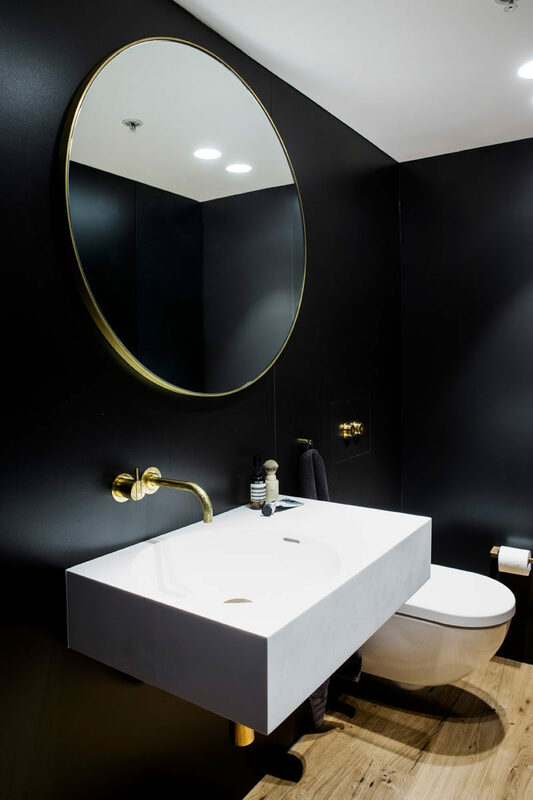 In the second bathroom of the apartment, the look is consistent with the rest of the apartment interior, with more black walls, a large mirror and gold accents.